What is a Sand Painting? Definition: A Sand Painting, also known as a dry painting, is a Native American Indian ceremonial art form that requires sand or similar substances to be poured onto a surface to make a painting. The art of Sand Paintings were important among the Navajo and Pueblo people and used in connection with religious and Spiritual Healing ceremonies. Sand Paintings conveyed ideas in basic pictures and due to the materials and methods used to create sand paintings they were often of a temporary nature. 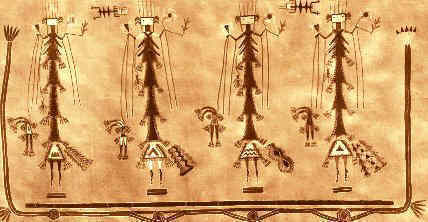 Depictions of Navajo spirits called Yei are commonly found on Petroglyphs and Sand Paintings. Yei derives from the word Yeibicheii meaning the Holy People. Sand Paintings were created to exist for only a few hours however, a movement by Native Americans in the late half of the 1900's created permanent Sand Painting as an art form. As sandpaintings are sacred an pieces created for exhibition or commercial purposes use reversed colors and variations. The size of a sand painting ranged from 2 square feet to as much as 20 square feet if created indoors. An outdoor surface might be used or the ground of a hogan, or on a buckskin or cloth sheet or cover. It might take many hours to create a large painting and up to 12 people worked on their creation. Sacred Navajo sand paintings are created and destroyed between sunrise and sunset of one day. The sacred art of sand painting had very specific purposes. The most prevalent reasons for creating a sand painting to heal the sick and to offer blessings. The blessings are offered to mark important and special occasions such as births, marriages and new homes. The sand painting ceremonies center around a purification ceremony. When the painting is finished the person to whom the painting is directed is seated on the painting and parts of it are rubbed on to the body. the Shaman will chant, asking the Yeibicheii, or Yei, to come into the painting and help heal the patient. Purification occurs as evil humors are driven from the person into the sand painting and healing begins. The sickness absorbed by the sand painting is buried or swept away as part of the ceremony. Just as the gods draw pictures upon the moving clouds, so the shamans make paintings on the sand, and when the purpose of the drawing has been fulfilled it is removed without a trace by a sweep of the hand. Various materials are used in the art of sand painting. Sand painting is the art of pouring colored sands, powdered or ground pigments from minerals or crystals, and pigments from other natural stones and rocks on to a base of smooth sand to make a sand painting. Occasionally other materials were used such as roots, cornmeal and flower pollen. These materials were used with charcoal to create a variety of colors. The colors of the sands was extremely important in creating sand paintings. The design for a sand painting is created using five sacred colors of sand. Each of the colors used in Sand Paintings have a specific meaning and each color represents a physical direction. The Navajo tribe believe that the colors yellow, blue, white, and black were of great significance as they represent four sacred mountains and the four cardinal directions. The Medicine Man mixed the sands in order to create variations of colors for a sand painting.